This superb Annunciation counts among the best work of the Dunois Master and his workshop. Scholars suggest this illuminator trained with and continued the work of the Bedford Master, who likely was his father. Both are nowadays identified as Haincelin of Hagenau and his son Jehan Haincelin. The Archangel Gabriel approaches the Virgin from the left side. He is dressed in an exquisite red cope trimmed with gold brocade, decorated with gems and fastened by enormous gold clasp or agraffe. Mary kneels before her open book on a lectern. She crosses her arms and bows her head in modesty and devotion, accepting God’s decision for her to become his son’s mother. God appears at the top left, in a radiant golden circle. He sends down golden beams to embed the Holy Spirit into Mary’s body. The scene takes place in an architectural ensemble of arches and vaults that recalls the temple in which the Virgin lived at the time of the Saviours’s conception. The room is partly shielded from view by a golden cloth of honour, behind which looms a green canopy that may be the dais of Mary’s bed. The surrounding border is handsomely decorated with colourful acanthus leaves in which angels play different musical instruments to celebrate and announce the conception of God’s son. 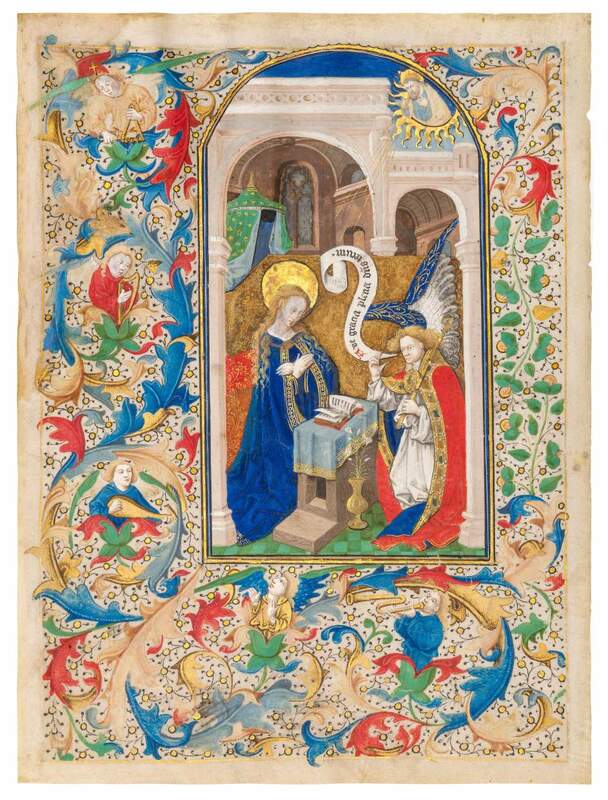 The fine miniature leaf comes from a deluxe Book of Hours and originally would have opened the Matins of the Office of the Virgin.